No book signing events currently scheduled. Check back for updates or subscribe to events on Facebook. Would you like to partner with us in promoting your architecture themed book event? Please contact our office. Ethne Clarke, internationally known lecturer and author, will give a richly illustrated talk about mid-twentieth century garden design, the subject of her new book. 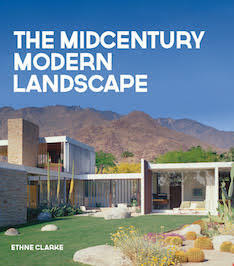 The Mid-Century Modern Landscape is a fresh guide to the period and filled with inspiration for today’s home garden. Clarke will explore the origins of midcentury modern garden design, revealing how architects like Frank Lloyd Wright and Cliff May, creator of the now ubiquitous ranch house, worked with landscape architects to blur the divisions between indoors and out. Copies of the book will be available for purchase. This event is presented by the Iowa Architectural Foundation and the Greater Des Moines Botanical Garden. 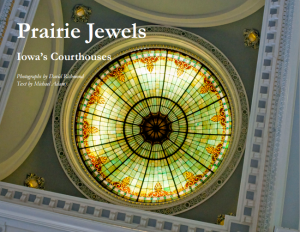 Prairie Jewels: Iowa’s Courthouses, a unique new book by photographer David Richmond and writer Michael Adams, is filled with striking panoramic images of Iowa’s county courthouses and their surrounding communities. Wonderful narratives incorporating large chunks of history, architectural detail, journalism and personal observation accompany each image. Richmond and Adams traveled to all of Iowa’s 99 counties to photograph and tell the story of each of the state’s 100 county courthouses. Among the Romanesque, Beaux Arts, Victorian, Prairie and contemporary buildings they encountered, they found are tales of community pride, intrigue, gravitas and whimsy. The book will live for decades to come as an essential resource for those interested in Iowa’s history, architecture and governance. David Richmond, Professor of Art at Simpson College, has enjoyed wide-ranging experiences in graphic design, photography and visual storytelling over his 30-year professional career. His academic teaching background includes photography and design at the University of Iowa College of Art and Art History; graphic design at Dickinson University in North Dakota; and art and photography at Simpson College in Indianola, Iowa. Michael Adams has been a writer, photographer, speechwriter and editor during a rewarding career in journalism, public relations and marketing. He is the author of the novel The Alley of Angels; an award-winning play titled China; and a travel memoir, Our Man in Stavropol, published by the Iowa Sister States Commission following a photographer exchange to Stavropol, Russia; in addition, he has published numerous articles in regional and national publications, and he has had several solo photography exhibits to his credit. He is a journalism graduate of the University of Iowa and spent four years in the U.S. Air Force stationed in the United Kingdom. He was born in Washington, D.C., and has lived in Iowa for the past 45 years. The Melson House Revealed: An Owner’s Perspective details the history of this nationally-significant house built in Mason City in 1912. The Melson House, selected by the Iowa Chapter of the American Institute of Architects as one of the most significant 50 structures built in Iowa during the 20th century, is an excellent example of organic and Prairie School architecture. Stones to build the three-story home were quarried on site and it is difficult to tell where the natural limestone cliff of the property ends and the house begins. Designed by Prairie School architect Walter Burley Griffin with a presentation drawing exquisitely drafted by Marion Mahony Griffin, the Melson House has been described in many architectural books, but this is the first book dedicated exclusively to the house. Readers will find a combination of academic and historic information about the house as well as stories about living in and restoring the house. The book is well illustrated with numerous photographs of the exterior and interior. 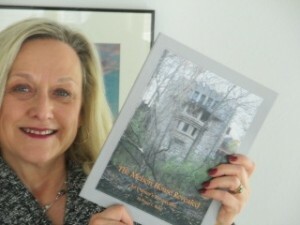 An award-winning photographer, Peggy took several photographs which capture the essence of the home and its unique site including the cover image of its north facade that faces Willow Creek. In addition to signing her book, Peggy will give a brief talk on the Melson House and will share stories of living in one of Iowa’s most famous homes. Peggy Bang, a retired Visual Arts Professor from North Iowa Area Community College, is a long-time Mason City preservationist. She received her BA in Art Education from Iowa State University and a MA from Bank Street College in New York. Peggy has lectured nationally about various aspects of Prairie School architecture. She served as president of Wright on the Park, Inc. and was instrumental in saving and restoring Frank Lloyd Wright’s Park Inn Hotel in Mason City. She and her husband Roger own the historic Melson House in Mason City. 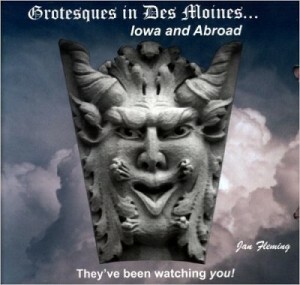 Grotesques in Des Moines Book I examines the stone carvings known as “grotesques” and how they differ from “gargoyles.” Some of the finest examples in the world can be found in Des Moines and elsewhere in Iowa. These are compared to those found in other parts of the United States and in Europe. Book II pays particular attention to the type of grotesque known as the “Green Man,” identified by foliage as part of the image. The author traces this archetype through carvings, festivals, nature, and any number of other milieus. One exciting revelation found in this book is the discovery that a number of these carvings can be seen as a second image when turned UPSIDEDOWN! Previously unknown, this finding has caused scholars and carvers to express great interest in these carvings and the search is now on for more of them.